Have you ever been to a camp before? 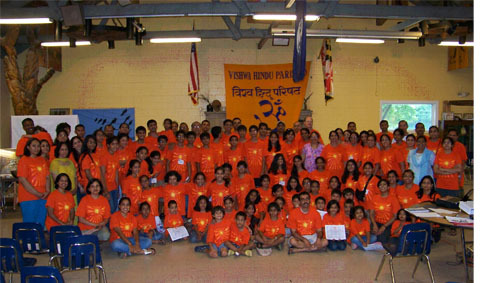 Well, even if you have, you probably have not been to one like Shantaniketan family camp organized by the VHP of America. This camp has something in store for everybody. For younger kids there are fun games and activities. For adults there are valuable lectures and sessions about subjects such as our Hindu Dharma. 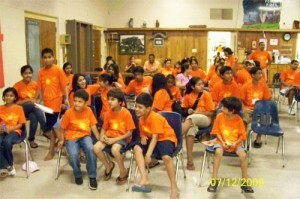 The first night of camp, everyone comes in and gets registered. Once they are registered, they find their cabins and settle in. The first night is also when most people meet their old friends and make many more new ones. Everyone is tired. Light refreshments are served and then everybody goes to sleep. The next morning, wake up is around at 6 o’clock. 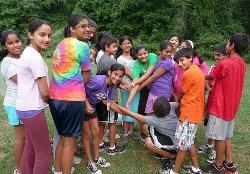 Everyone gets up and heads to the main hall to have the morning announcements and then head out for yoga/games. This early morning exercise gets everybody up and running for the busy day ahead. Once that’s done, its time for breakfast. 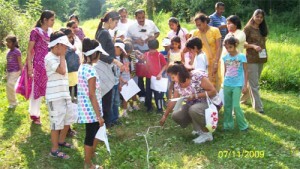 After breakfast, there are learning sessions for the kids and lecture sessions for the adults. 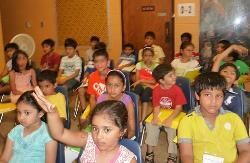 These lectures and classes help nourish the value and knowledge of Hindu dharma. Younger kids are taught the basic essentials and building blocks, while the older kids venture deeper and deeper into the meaning and force behind it. All while enjoying and having a great time. Families also enjoy events such as the campfire. At the campfire, everybody gathers around in the woods around a big fire. They eat smores and sing till they can’t anymore. After the campfire, everyone goes to bed for a good night’s rest. They have a big day ahead of them. My personal favorite (many can say this applies to them as well) is the Treasure Hunt. This is an event where 4 teams go around a large area, including the forest and hiking trails, in search of clues. When a team finds a clue, they have to answer a question in order to obtain the clue and its contents. Once they have found all the clues, they go back to the main hall to claim their victory. After a tiring hunt, everyone goes back to their cabins, shower, and get ready for a night filled with talent, singing, and dancing. Especially garbah and raas. Everyone has fun, and no one is left out. A live “band” plays and sings music for the garbah. After all are tired, everyone heads back to the cabins for a peaceful night’s sleep. The last day is still more exciting. Although everyone is leaving, there is still one thing that hasn’t been played yet. That is jeopardy. On the last day, everyone gathers in the main hall for a game of jeopardy. Questions are written for people of all ages. There are questions for the adults, questions for the children, and questions for everyone in general. Once the game is done, it is time for everyone to say goodbye till next year. That means a whole year full of anticipation for next year’s camp. It is a tedious wait, but completely worth its cause. 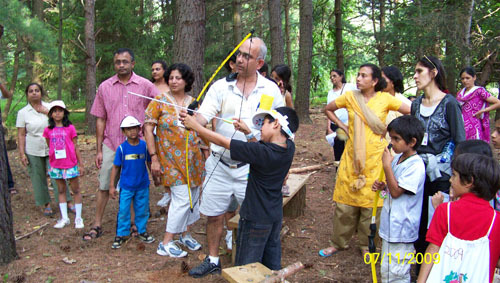 The Shantaniketan Family Camp is truly an amazing experience. The amount of fun and all that goes on can’t even be put into words. Not even if anyone tried. The only way to really know what it is, is to experience it yourself.